After a while, you just learn to turn the sound off. It’s not like listening to a broadcast will add anything to your understanding of the game anyway. In hockey, I mean. I gave up on baseball broadcasters long before Tim McCarver was honored as one of the best at that, but baseball is different. It’s a slow game, so the commentators have to fill in the gaps. In hockey, they just need to tell you who’s on the ice and fill an occasional bit of dead air. As I’m living in the U.S. of America, I’ll be picking on the coverage down here, but you can’t tell me it’s better in Canada as long as Harry Neale still has a microphone in front of him. Well, OK, one reflection on Harry Neale: The man’s almost as good an announcer as he was a coach and a quick look at his won-loss record (150-212-80, for those of you not inclined to click on the link above) tells you how good a coach he was. I have no idea how he’s back on the Toronto Maple Leafs network after his infamous call blaming Doug Gilmour for Marty McSorley going all, well, McSorley on him (Neale’s blathering starts 1:25 in … “there might have been an elbow.” F*** you, Neale, and the Gretzky f***ing bandwagon you rode in on). The return to the European-sized rink – 200 feet long by 100 feet wide – will give hosts Russia and the nine other European teams a better chance of taking down Canada and the United States. The extra 15 feet on each side – a combined 3,000 square feet larger than the NHL version – minimizes brawn by making it harder to check opponents and gives speedsters like the Russian duo of Alex Ovechkin and Ilya Kovalchuk and Swedes Erik Karlsson and Carl Hagelin more room to maneuver. Or the Americans, with Phil Kessel and Zach Parise, or the Canadians with, oh yeah, the whole team. Look, if Canada wanted to play a “Canadian” style game and lose, they would have taken Milan Lucic … the prototypical power forward in the NHL these days, a proven winner with an attitude and a big shot, a Vancouver native in his prime. Instead, they took Matt Duchene and John Tavares and, well, you get the idea. Russia’s checking forward is Nikolai Kulemin, who is a perfectly serviceable third-line checker on My Beloved Toronto Maple Leafs, but Canada’s designated checker is Patrice Bergeron. Tell me again how more room to skate is a bonus for Russia? Or the Swedes, who have exactly one-half of the Sedin twins and an average age of 73. Or the Finns, who are ready to party like it’s 1999, with Teemu Selanne, who got practice on the big ice during the NHL lockout of 1994 and Olli Jokinen, who is playing for the Winnipeg Jets and it only seems like he’s been around since the WHA’s Winnipeg Jets. 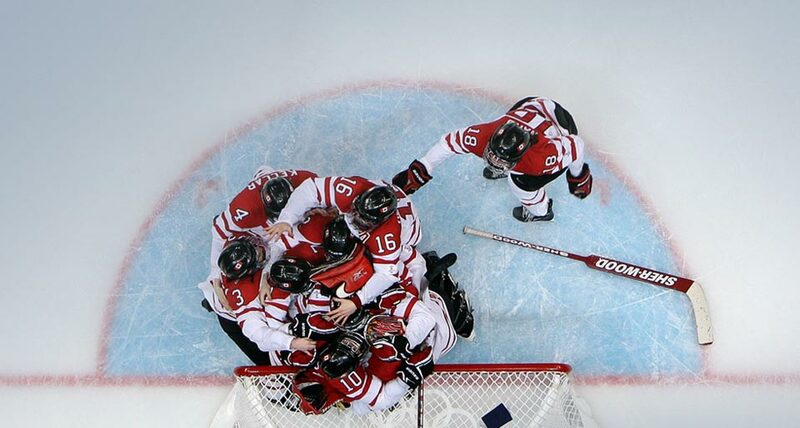 I understand that commentators are desperate to come up with reasons why Canada shouldn’t win the gold, because a) everybody else is jealous of the Canadian team and b) it’s boring to say “Canada should win,” but Canada should win. I mean, there’s been this whole discussion of whether having P.K. Subban holding the door open during line changes will hurt Canada defensively, while Russia’s best player is so dire defensively that his club team often benches him late in games where they have a one-goal lead. * Apologies to my buddy Greg Wyshinski who at least comes by his man-crush on A.O. legitimately, living and working in the D.C. area.